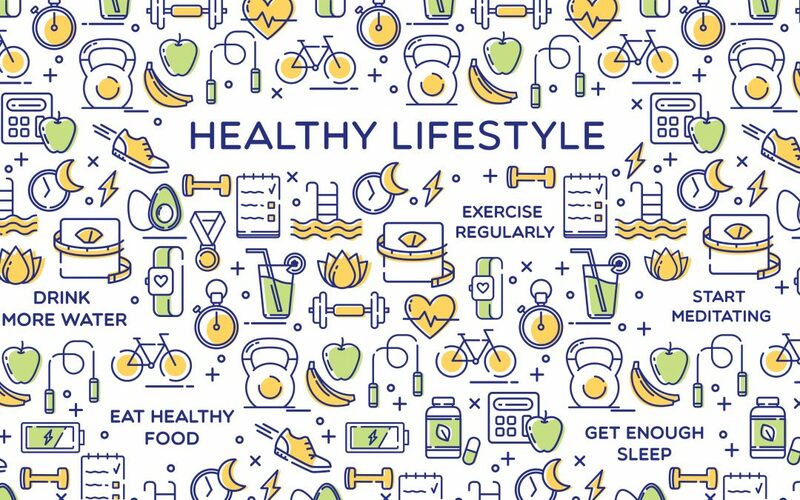 It’s a fact—maintaining a healthy weight through diet and exercise is one of the best ways to stay well. Being overweight or obese can put your body at risk for long-term, chronic conditions. But because each of us is different, our definition of what ‘healthy’ means for our bodies and lifestyles is different as well. Factors such as age, height and gender can help define what healthy means for each of us. From there, it’s a matter of finding the best tools and methods to help us stay on track and reach our wellness goals. Many of us don’t have a nutritionist or a personal trainer on speed dial. But there are easier, less expensive ways to keep track at home. There are different methods to measure our weight and fitness levels, and different tools to manage and track our measurements over time. BMI, or the Body Mass Index, is a way to figure out if you have a healthy weight by calculating the ratio of your weight to your height. BMI is not an exact measurement of your overall health or weight. Alone, it is not enough to fully evaluate your body weight. When used correctly, BMI can help determine if you might be at risk for developing obesity-related health issues. These conditions include diabetes, arthritis, liver disease, high blood pressure, high cholesterol, sleep apnea and several types of cancer. The World Health Organization defines a healthy body weight as a BMI between 18.5 and 24.9. Overweight falls between 25 and 29.9, and obesity is defined as a BMI of 30 or greater. Not everyone falls neatly into these three categories. You might be very muscular and fit, like Serena Williams, and have an overweight or obese BMI. Or, you might have a normal BMI but still have a relatively high percentage of body fat. How do you measure BMI? You can calculate your BMI on pen and paper the old-fashioned way using this formula. Or, you can use a reputable, online BMI calculator to save you the trouble of doing any math. BMI can serve as a helpful benchmark for losing weight and monitoring your health at home. But to help monitor overall health, BMI should be used with other measurement tools for a more complete picture. One limitation to BMI is that it doesn’t measure where fat is stored in the body. An older method for measuring body fat is to quite literally “pinch an inch.” Pick a spot on your body and grab a fold of skin with your thumb and forefinger. If the skin is more than half an inch thick, there may be a high percentage of fat in that area. For a more accurate measurement, a trained health care professional will use calipers to measure body fat. If you’re trying to lose weight, you should start to pinch less and less as you repeat the process. Keep in mind this method isn’t 100% foolproof. Even experienced professionals can get different results with the same equipment. Remember to focus less on the number and more on the changes to the number. And much like BMI, make sure you’re doing this test in combination with other ways to measure your progress. Your waist size can be a helpful measurement for tracking your weight at home. The National Heart, Lung and Blood Institute says that as your waist size increases, so do risk factors associated with obesity. These risk factors increase with a waist size greater than 35 inches for women and 40 inches for men. Measure by wrapping a tape measure around your waist. Start at the top of your hipbone and stay level with your belly button. Keep the tape measure straight, and try not to wrap it too tightly or to hold your breath. Make note of any increases or decreases in measurement to keep track of your progress. Weigh in. New research shows that getting on the scale everyday can help you track weight changes over a longer period of time. The numbers don’t lie, and if you watch your weight, you’ll be able to identify patterns and behaviors that are contributing to losing or maintaining weight. Plus, writing down the changing numbers will help you see the long-term results of your healthy habits. Remember to be consistent – try to weigh yourself in minimal clothing, on the same scale and at the same time. Pick a cadence that suits your personal preferences, such as daily, every other day, or weekly. The important part is to track and monitor your fluctuations so that you can have a deeper understanding of physical body. The selfie test. If you prefer your tracking to be a little more high-tech, take pictures of yourself on a daily (or weekly) basis and compare over time. Again, you won’t see the transformation immediately, but you will have a visual record of your health journey. Physical tests. If you’ve been physically active for a while, try a test that’s a little more athletic. Identify a physical fitness activity to do on a daily basis, such as pushups, pullups or the step test. Keep a record of how many you can do every day, and you’ll see that number increase over time. Tracking weight is important, but think about the other health benefits of getting fitter. If your fitness program is working for you, your resting heart should lower over time. You’re putting in the effort to strengthen your body, and as a result, your heart won’t have to work as hard to pump blood. Remember that our bodies often aren’t at rest, either physically or mentally. Your resting heart rate can often be affected by stress, medication, chronic conditions and recent activity. To get the most accurate resting heart rate, track first thing in the morning, when you’re still in bed and your body is still relaxed. You can measure your resting heart rate by taking your pulse at a few areas on your body – your wrist, neck or inside of your elbow. Count your beats for 10 seconds and multiply that number by six, or count your beats for 15 seconds and multiply that number by four. You can also purchase a heart monitor to measure your resting heart rate electronically. What’s a good resting heart rate? Because our bodies are all different, it varies, but a normal rate for adults is between 60 and 100 beats per minute. If you’re more fit, your heart rate might be in the 40s to 50s. It may sound strange, but spending some time on your smart phone might just help improve your health. There are a number of apps out there that can help track exercise and diet. These apps can keep track of steps taken, substitute as your training partner, and even provide nutrition information on common foods and local eateries to help track calories burned and consumed. They can also analyze recorded data to provide suggestions for making workouts and dieting plans more effective. With this information in the palm of your hands, you can set realistic, achievable goals to keep your progress on track. The growth in wearable technology from FitBits to Apple watches has given consumers the power to track different measurements at home, around the office and on the go. According to Soreon Research, health care wearables could save as many as 1.3 million lives by 2020. These handy devices can help you track sleep patterns, steps taken, calories burned, blood pressure, cholesterol, heart rate, blood sugar levels and more. You can upload this information directly to your smartphone and track data over time to help you monitor your progress on a daily basis. By having this information in the palm of your hands, you can monitor key health measurements at home and learn to take more control over your health and wellbeing in between doctor’s visits. It might seem like a lot of information to keep up with and monitor on your own, but the key is to figure out what measurements and tools are the most useful for you. BMI is a great place to start for monitoring your health at home, but some other measurement tools are necessary to get a more complete picture of your health. As you take ownership in managing your health care needs, you can use these tools to take more control of your own health and set realistic health goals in between doctor’s visits. Gabe Staub is a health promotion specialist and wellness program developer at Blue Cross NC with a passion for impacting our members’ health and well-being. He enjoys his family, food, exercise, yard work, and watching and playing sports.